The online version of this article ( https://doi.org/10.1186/s13054-019-2378-9) contains supplementary material, which is available to authorized users. 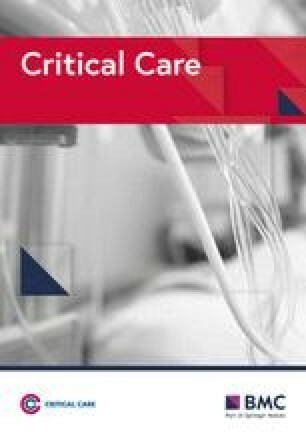 The severity of infections and the frequent resistance in ICU-acquired infections, as well as the numerous pathophysiological specificities related to the critical care setting, make the conduct of beta-lactam treatment in critical care patients challenging. However, sepsis and septic shock require the rapid administration of the appropriate antibiotic at the appropriate dose. Indeed, numerous studies have shown that a delay in the administration of an appropriate antibacterial therapy is associated with increased mortality in the most severe patients [4, 5, 6]. The risk of treatment failure appears therefore to be at the same time higher and more serious than for non-critically ill patients. In this context, the unpredictability of critical care patients’ exposure to beta-lactam antibiotics for a given dose should be particularly taking into account, advocating for therapeutic drug monitoring (TDM) of beta-lactams. Available studies support this strategy, even if the clinical impact on patient’s prognosis is not yet fully demonstrated . In addition, concentration targets are not consensually defined although it is an essential prerequisite for conducting further studies. However, pending large randomised clinical trials, TDM performed since the first few hours of treatment and frequently controlled on the following days may allow for a best achievement of concentration targets while limiting the risk of adverse events. Thus, in the era of personalized medicine, the individualization of beta-lactam dosage and administration regimen seems, more than elsewhere, to be required in critically ill patients. Although evidence of the beneficial clinical impact of this approach is growing in the scientific literature , there is currently no positioning of learned societies on this subject. Modifications of the volume of distribution (Vd) and renal clearance of beta-lactams are major sources of PK variability observed in critical care patients. For instance, mean Vd and clearance of cefepime could vary in ICU patients from 0.08 to 0.55 L/kg and 0.062 to 0.131 L/kg/h, respectively [16, 17, 18, 19, 20, 21, 22, 23, 24]. Patients’ diseases also influence antibiotic PK. For instance, Isla et al. reported higher Vd and clearance of meropenem in polytraumatised patients than in septic patients (Vd 69.5 vs. 15.7 L and clearance 54 vs. 8 L/h) . Such an important variability of Vd and clearance has been reported for almost all beta-lactam antibiotics [12, 26]. The SIRS presented by septic ICU patients is often accompanied by increases in cardiac and renal blood flows and in glomerular filtration rate (GFR) in the absence of acute kidney failure . The administration of IV fluids and vasoactive drugs also contribute to GFR increase. All these factors contribute to augmented renal clearance (ARC) that reduces the elimination half-life of drugs excreted by the kidneys. ARC, defined as a creatinine clearance (CLCR) > 130 mL/min/1.73m2, can affect up to 40% of septic ICU patients [33, 34, 35]. Beta-lactams are hydrophilic antibiotics whose elimination is primarily renal. The increase of their renal clearance generally leads to reduce plasma concentrations [36, 37, 38]. Consequently, several algorithms for dosage adaptation of various beta-lactam antibiotics with respect to patient’s CLCR have been proposed, but with incomplete effectiveness in achieving PK objectives [39, 40]. In addition, low serum albumin concentration is frequently observed in ICU patients, leading to an increase in the free fraction of the beta-lactams highly bound to plasma proteins, such as cefazoline, ceftriaxone, or ertapenem. Thus, hypoalbuminemia may lead to increased Vd and tissue penetration, and also increased elimination, of beta-lactam antibiotics by glomerular filtration and/or metabolic clearance . This has been particularly observed for ceftriaxone or ertapenem [41, 42, 43, 44]. 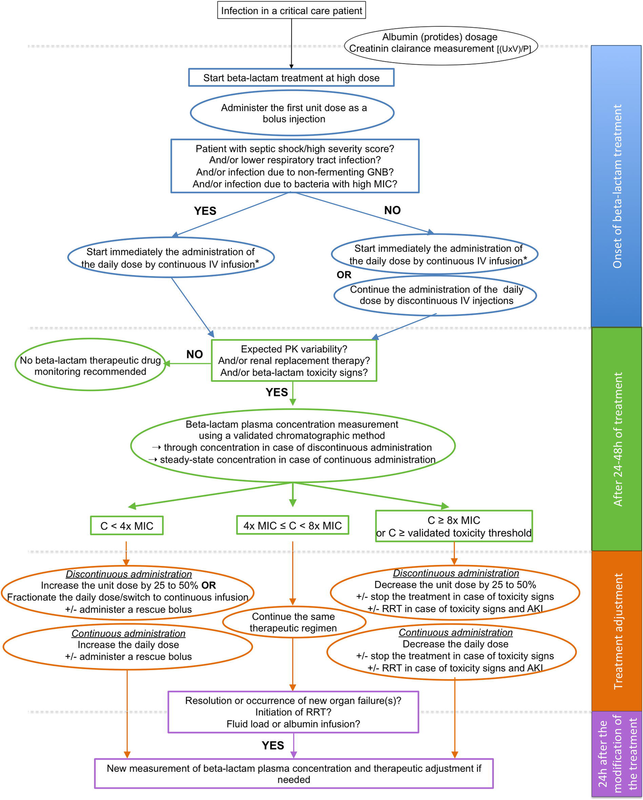 To estimate the GFR, recent French guidelines recommend the calculation of creatinine clearance using the following formula: Ucreat × V/Pcreat, “Ucreat” being the urinary creatinine concentration (in mmol/L) measured in an urine sample collected over a period of at least 1 h, “V” the urinary volume expressed in mL per time unit, and “Pcreat” the serum creatinine concentration (in mmol/L) . Indeed, estimated creatinine clearance formulas (sMDRD, CKD-EPI, Cockroft and Gault) were developed for stable patients with chronic renal insufficiency and must not be used in critically ill patients in whom normal creatininemia despite altered GFR is frequent [47, 48, 49]. Despite experimental studies generally reported a bactericidal effect of beta-lactams for a minimum value of %fT > MIC between 50% and 70%, clinical data focusing on ICU patients reported favourable clinical course for higher PK-PD targets. In a large multicenter study including eight beta-lactam antibiotics, a 100% fT > MIC was associated with improved clinical outcome in septic ICU patients compared to 50% fT > MIC (OR 1.56–95%CI [1.15–2.13] vs. 1.02 [1.01–1.04], p < 0.03) . Several other PK studies, using prospectively collected data from phase 3 randomised controlled trials, confirmed that the value of 100% fT > MIC was associated with improved bacteriological and clinical cure in ICU patients treated with cefepime or ceftazidime [56, 57]. In patients with infections caused by Escherichia coli and Klebsiella species treated with Cefepime, a classification and regression tree (CART) analysis showed that a fCmin/MIC ratio above 7.6 was associated with bacterial eradication in 100% of patients . Conversely, only 33% of the strains were eradicated when fCmin/MIC was below 7.6. Other authors also reported that clinical cure in ICU patients required beta-lactam plasma concentration reaching four to six times the MIC [59, 60]. These clinical data are supported by in vitro and in vivo experimental data showing both a maximal bactericidal effect and the prevention of selection of bacterial subpopulations resistant to beta-lactams for concentrations between four and eight times the MIC [56, 57, 61, 62, 63, 64]. The main risk factor associated with neurological toxicity of beta-lactam antibiotics is renal failure, which may cause rapid and significant accumulation of beta-lactams. Some molecules such as cefepime or cefazolin have a lower neurotoxicity threshold than other beta-lactam antibiotics (Table 1) [68, 69, 70]. A literature review including 37 studies representing 135 cases of neurotoxicity related to cefepime administration showed that cefepime neurotoxicity occurred in 48% of cases in patients overexposed, but in 26% of cases in patients appropriately exposed to the drug taking into account their renal function . For four of them [84, 85, 86, 87], the methodology was similarly subdivided into three stages: (1) creating and validating a population pharmacokinetic (POP PK) model based on plasma concentrations measured in volunteers according to the usual administration regimen; (2) from the POP PK model, 10,000 kinetic profiles were simulated using Monte Carlo simulations according to different administration regimen and dosing; and (3) then the percentage of simulated profiles reaching a defined percentage of time above the MIC (known as the “Probability of Target Attainment” or “PTA”) was calculated for an extended range of MIC values. The MIC from which the tested dosage regimen (including the dosing, frequency of administration, and continuous vs. discontinuous administration) is no longer deemed “pharmacologically efficient” is defined as the MIC for which the PTA becomes less than 90% or 95% (PTA90%, PTA95%) for a given % fT ≥ MIC. In Krueger’s study, continuous meropenem administration achieved the PK target of 40% fT ≥ MIC for bacteria with MIC ≤ 4 mg/L (at a dose of 3 g/24 h) and ≤ 2 mg/L (at a dose of 1.5 g/24 h), while intermittent administration only achieved the same target for bacteria with MIC ≤ 0.5 mg/L (3 g/24 h) and ≤ 0.25 mg/L (1.5 g/24 h) . Similar results were obtained with imipenem, for which a continuous administration of 2 g/24h achieved the PK target of 40% fT ≥ MIC for bacteria with MIC < 4 mg/L, while intermittent administration of 1g × 3/24 h only achieved the same target for MIC <2mg/L . In Landersdorfer’s study, continuous or prolonged administration over 4 h of 6 g/24h of flucoxacillin achieved the PK target of 50% fT ≥ MIC for bacteria with MIC < 1 mg/L, while administration of the same daily dose by 30-min infusions only achieved the same target for MIC < 0.375 mg/L . In De Jongh’s study, continuous infusion of 4 g/24h of temocillin achieved the PK target of 40% fT ≥ MIC for bacteria with MIC ≤ 16 mg/L, while 30-min infusions of 2 g twice daily only achieved the same target for MIC ≤ 8 mg/L . In the meta-analysis led by Roberts et al. based on the individual data from 632 ICU patients suffering from severe sepsis included in three randomised controlled trials (BLING I, BLING II and BLISS), more than two thirds of the infections were due to Gram-negative bacteria (GNB) . In this meta-analysis, there was a clear correlation between infections due to non-fermenting GNB and 30-day hospital mortality (OR 2.72 [1.32–5.62], p = 0.01), while infection due to non-fermenting GNB was an independent covariate included in the final Cox regression model demonstrating an improved survival rate with continuous compared to intermittent beta-lactam administrations. Similarly, a negative correlation between the presence of GNB and (i) clinical cure rate (p = 0.036) and (ii) 30-day survival (p = 0.039) was also found in the DALI study . The superiority of continuous beta-lactam administration is also reported in the meta-analyses conducted by Lee et al. and Lal et al. in which respiratory infections were mainly due to GNB. In addition, three retrospective studies included in the meta-analysis by Lal et al. or included in the systematic review added by Lee et al. at the end of their meta-analysis  also showed an improved clinical cure rate in patients with infections due to GNB with the highest MIC treated with continuous beta-lactam administration [102, 103, 104]. Few studies have assessed the impact of beta-lactam therapeutic drug monitoring (TDM) in ICU patients, and none of these studies reported an impact on clinical outcome [109, 110, 111]. However, drug exposure and PK-PD target attainment have been shown to be higher when using TDM. Due to the large PK variability of beta-lactam antibiotics reported in ICU patients (cf. first area), TDM appears then as an important tool to avoid drug under- or overdosage, as recently described by Wong et al. .